posted by Anne Marie Starowitz in Boulder Park, Anne Marie Starowitz, Back in the Day, history, indian falls. From my book "Back in the Day. Snapshots of Local History, the Way I see it." It was a warm Sunday afternoon. My brothers and I were sitting in the backseat of our parents’ station wagon. We all were watching for the sign that said Boulder Park, Indian Falls, NY, on Route 77. We could not contain our excitement. We were clutching the coupon that said bring this coupon and 25 cents to Boulder Park and get 50 cents worth of ride tickets for children under the age of 12. All rides are a nickel. We finally arrived at the park, and of course we could not agree on what ride to go on first. Would it be the merry-go-round, Ferris wheel, a kiddies’ automobile ride, the airplane ride, or the kiddie chair planes? The man responsible for those memories was Phil Morrot. He bought the Reynolds Farm and Feed Mill on Phelps Road. There, he and his sister Emily created Boulder Park. He selected the area because it was the heart of Indian Falls. It was located between two great hills in the narrow valley of the Tonnewanta, now called the Tonawanda Creek. It was the site where six Indian Trails met. It was sometimes described as a well-hidden fairy spot, blessed by God and nature. The Morrots were not the first who wanted to utilize this beautiful area. In 1929, Ely S. Parker’s grandson, Arthur, a New York State archeologist, endorsed a proposal by Nathan Strauvis Jr., a member of the New York State Senate, to preserve its beauty as a state park. 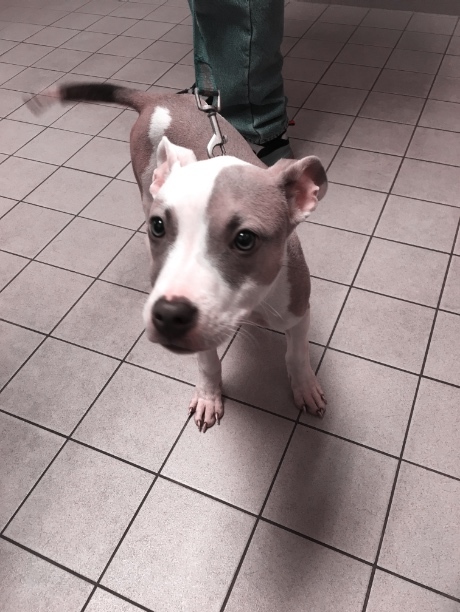 He was interested because at one time his famous grandfather owned the area. The owner at the time, knowing the land was in demand, raised the price to an amount the state was not able to afford. 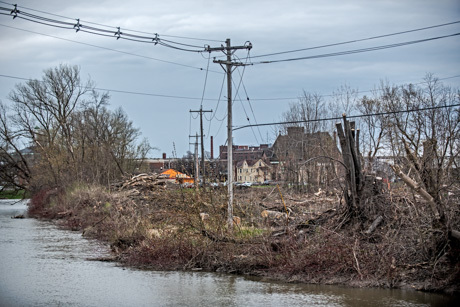 Another proposal was to tear down the mill and build steps leading to the gorge below connecting the Tonawanda Creek with Diver’s Lake. This would have made a horseshoe park. This was another failed dream. 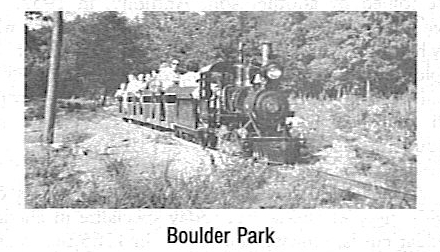 In 1949 Morrot’s vision for Boulder Park was fulfilled. 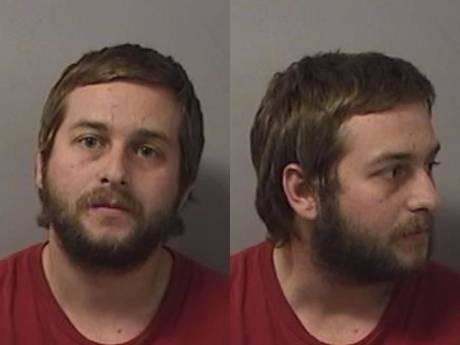 The area covered 14 acres, including Morrot’s home. Hundreds of automobiles from as far away as Buffalo, Rochester, and Olcott Beach made the pilgrimage to the Boulder Park. The first rides to be constructed were the famous merry-go-round or as some call it, the carousel. It replaced the old apple processing building. Emily Morrot Bourgard, Phil’s sister, designed the carousel. Herschell Company built it and it was said that the carousel was the best product Herschell Company ever built. The merry-go-round was one of a kind. It had thirty-two horses and seven unique animals that included a giraffe, an elephant, a camel, a reindeer with real horns, a lion, tiger, and a polar bear. 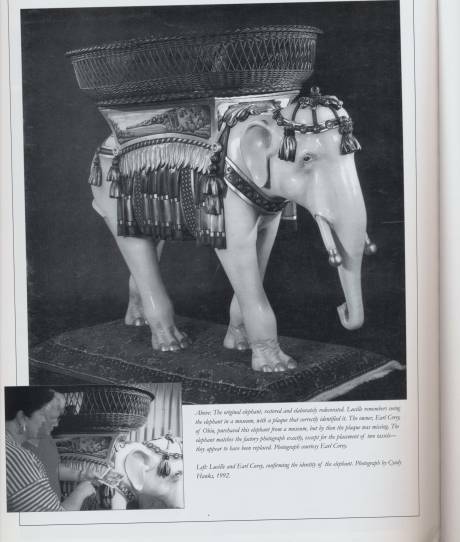 This ride was the first in America to have both an elephant and polar bear. The horses had elongated heads, decorated with plumes and jewels. They were realistic, elaborately carved animals. The merry-go-round’s first home was not Boulder Park. It was first delivered to Olcott Beach, NY. 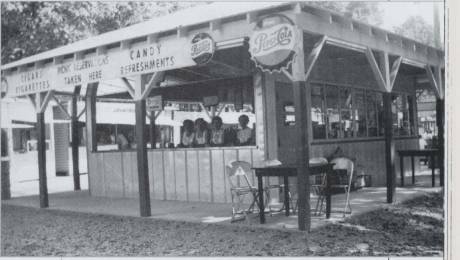 It was operating at Olcott Beach until 1947. 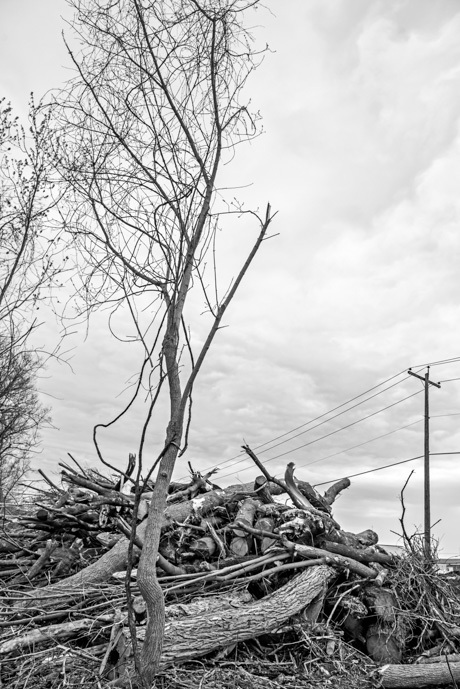 That was the same year Phil Morrot began clearing the land for his Boulder Park. Most people remember the merry go round. 1,200 electric light bulbs lighted it. The lights were reflected back from a double row of beveled mirrors, which were mounted on panels. The mirrors were alternated with original oil paintings of local landscapes. A Wurlitzer style military band organ provided the energizing music. In 1930 Theo’s sister Emily died at the hand of the merry-go-round she designed. She stooped down to pick up a ticket and the knee of the Black Charger struck her. The park employed at least a dozen workers. Mr. Morrot’s children also worked spinning pink cotton candy, taking tickets, serving hot dogs, and ice cream. It was truly a family owned business. In 1960 a mile long train track was added to the park. It went through the woods on the opposite side of the creek and returned to the park. Phil retired in 1964 and sold the park. The new owner let the park deteriorate. In 1970 Boulder Park was closed, never to reopen. Today, the once magical Boulder Park is just a happy childhood memory to many of us. 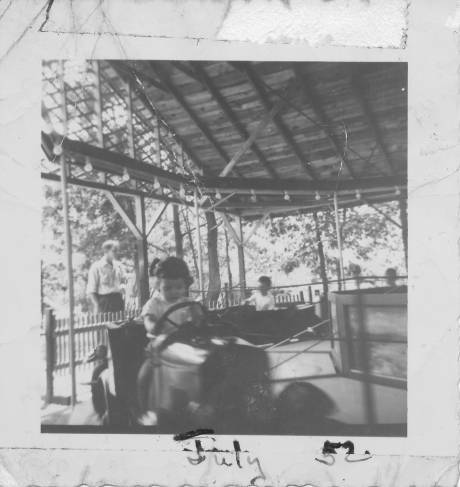 It was a time when parents could leave behind their jobs and go as a family to the wonderful world of Boulder Park to picnic and hop on any favorite ride for the cost of a nickel! Many thought of Boulder Park as our Disney World of Western New York. The area is back to its natural state, with wildflowers, and home to water snakes, raccoons, possums, skunks, and woodchucks. The famous carousel was dismantled and in dire need of restoration. The unique animals Emily created were sold individually at different auctions. In 1989 a collector purchased the polar bear for $121,000. Below, kids in kiddie cars. Below, this restored elephant is from the famous merry-go-round from Boulder Park. 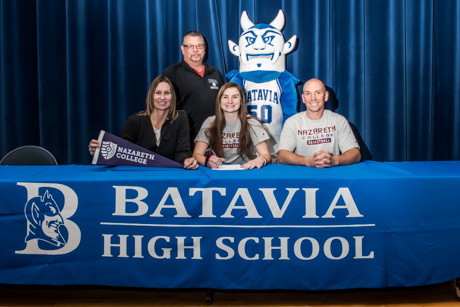 posted by Billie Owens in news, Announcements, batavia, first baptist church. The Alden Area Ecumenical Choir is presenting its spring concert this month titled “A Little Talk With Jesus In The Heavenly Sunlight.” Good Christian choral and solo music followed by a refreshment reception will make for a fun time. The choir always takes a free-will offering to benefit local and global needs. This year’s offering will benefit Rise Against Hunger, supported by the Marilla Methodist Church and Neat Repeats, a clothing ministry supported by the Alden Presbyterian Church. The choir offers two concerts, Friday evening, April 26, at 7 o'clock and late Saturday afternoon, April 27, at 4 o'clock. The Friday concert will be at the Alden Presbyterian Church, 13298 Broadway in Alden, at the corner of Crittenden. The Saturday concert is held at the First Baptist Church, 306 E. Main St., Batavia, between Summit and Swan streets. 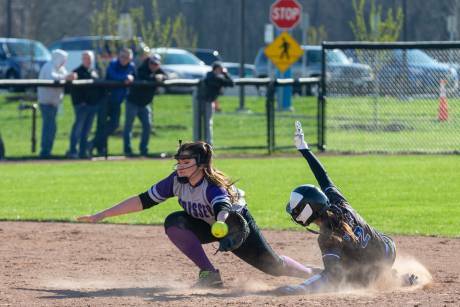 posted by Steve Ognibene in softball, sports, batavia, greece odyssey, girls softball, steve ognibene's blog. 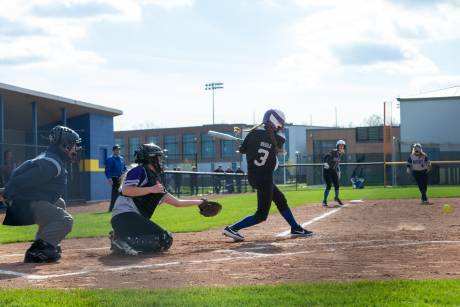 The Batavia varsity softball team bounced back from their previous game and defeated Monroe County Division 4 opponent Greece Odyssey by a score of 9-6 in a game played yesterday afternoon at Genesee Community College. 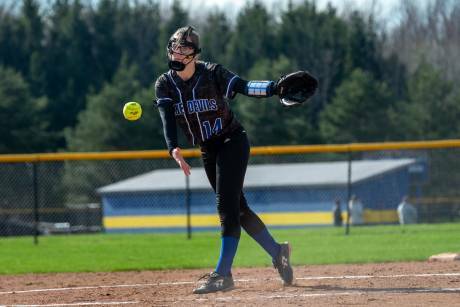 Alyssa Ognibene, in his first ever varsity start picked up her first varsity victory as she spun a complete game with five strike outs and scattering six hits. 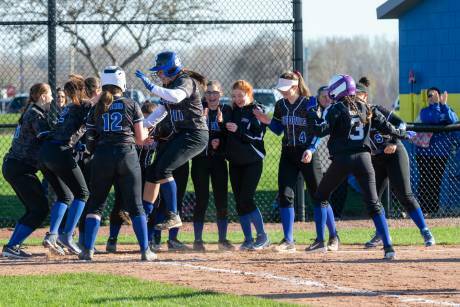 Maiya Reinhart went 4-4 at the plate, hitting for the cycle, including a solo home run, towering fly ball over the left corner fence (photo celebrated above with teammates). 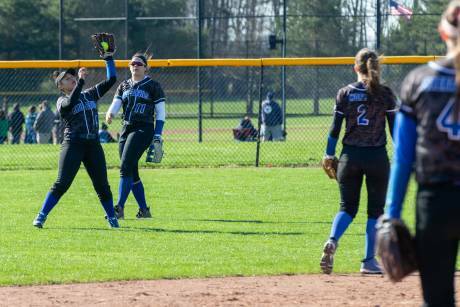 Reinhart drove in three runs for the lady devils. 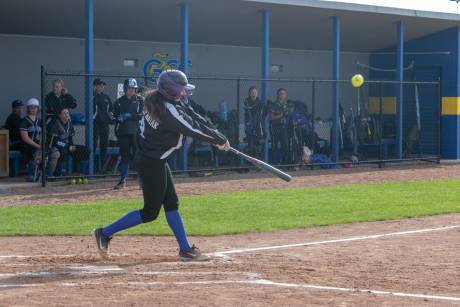 Jenae Colkey collected three singles and an RBI for the Lady Devils, while Ryann Stefaniak, Bryn Wormley, Mackenzie Reigle, Sonji Warner, Dallas Lama, Irelyn Curry, and Natalie Rogers also hit safely. 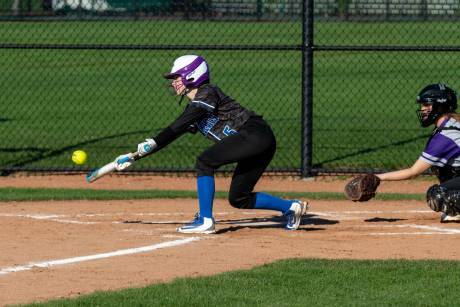 Rhorri Fix put down a perfect bunt for a base hit, while Julia Clark played very well defensively. With the win, Batavia moves to 1-0 in league play and 2-1 overall. posted by Howard B. Owens in Bontrager's Auction, batavia, hlom, history, news. A property deed from 1813 and signed by Joseph Ellicott was purchased at auction yesterday by the Holland Land Office Museum for $1,900. 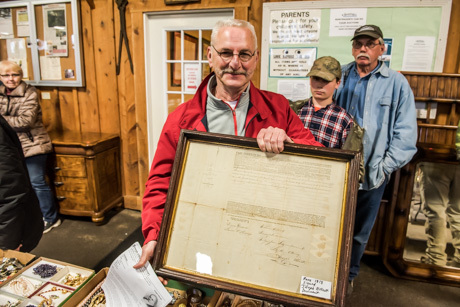 The deed was acquired last year by Dale Vargason, from Wayland, who found it in a box of 18th Century documents he acquired and then decided to bring it to Bontrager's Auctions. 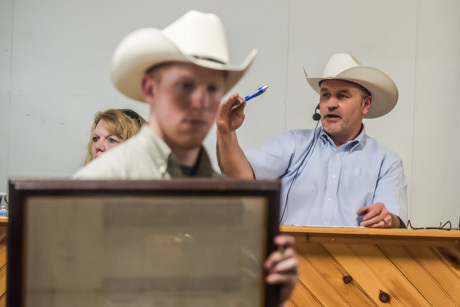 Auctioneer Todd Jantzi started bidding off at $1,000 and when there were no initial bids, dropped it down to $800. 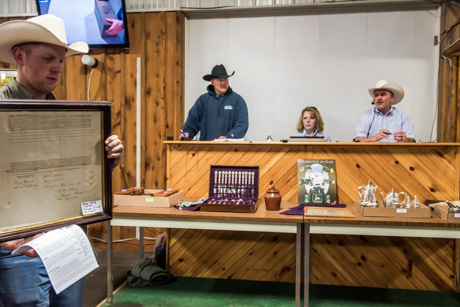 Two people then jumped into the bidding, including Gary Harkness, representing HLOM, and the bids quickly rose to the $1,900 mark. 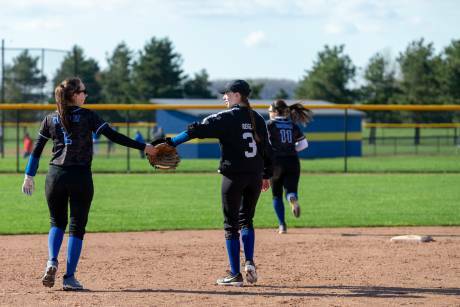 posted by Howard B. Owens in Batavia HS, batavia, news, sports. 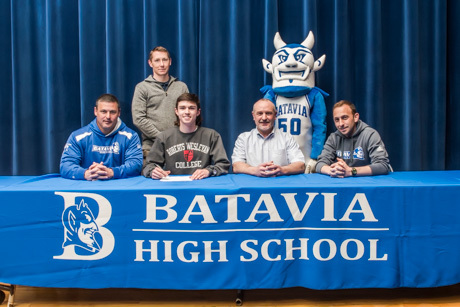 Several student-athletes at Batavia High School signed letters of intent with area colleges and universities on Wednesday, including Sam Sallome, above, who signed with Tompkins-Cortland Community College to play baseball. 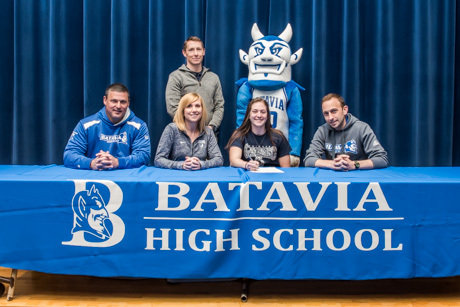 Sallome is joined by Jaime Sallome, Emma Sallome, Sam Sallome, Sr., Coach Rick Saunders, and Asst. Coach James Patric. 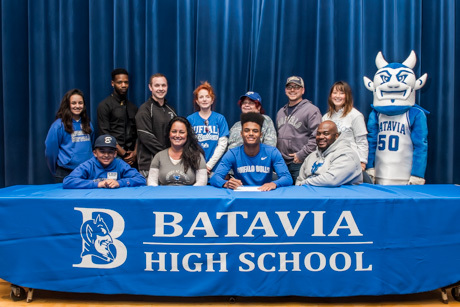 Taiyo Iburi-Bethel signed with the University at Buffalo to play football. Iburi-Bethel is joined by Mekhi Fortes (brother), Kinu Fortes (mother), Edwin Bethel (father), Lila Forte (sister), Darazian Williams (brother), Coach Brennen Briggs, Brenda Iburi (grandmother), Terri Ernst (grandmother), Shin Iburi (uncle), and Akari Iburi (aunt). Joe Martinucci signed with St. John Fischer to play football. He is joined by Aimee Martinucci, Joseph Martinucci, Michelle Martinucci, and Coach Brennan Briggs. Ryann Stefaniak signed with Nazareth to play basketball. She is joined by Anne Stefaniak, Rich Stefaniak, and Coach Marty Hein. 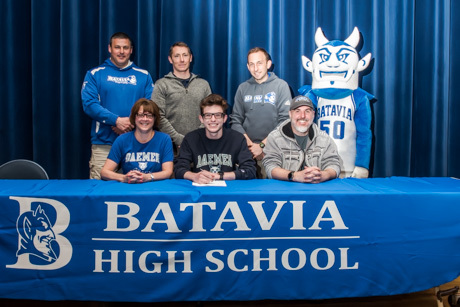 John Bruggman signed with Daemen to run cross country and track. 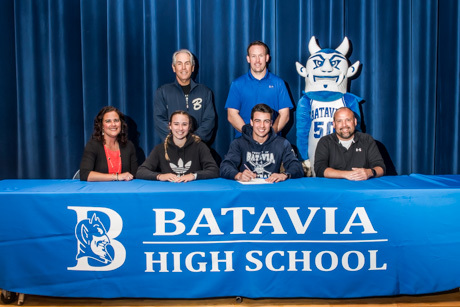 He is joined by Courtney Bruggman, Michael Bruggman, and coaches Dan Geiger, Rich Boyce, and Bill Buckenmeyer. Elizabeth Cohen signed with Geneseo to run cross country and track. She is joined by Coach Dan Geiger, Jeanne Cohen Coach Bill Buckenmeyer, and Coach Rich Boyce. Zak Jantzi signed with Roberts Wesleyan to run cross country and track. He is joined by Coach Dan Geiger, Todd Jantzi, Coach Bill Buckenmeyer, and Coach Rich Boyce. 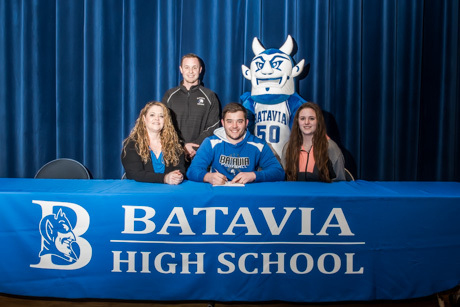 Ray Leach, the Blue Devils star running back who set several state records on his way to leading the Batavia to a state championship appearance, did not attend Wednesday's signing ceremony. He is expected to attend SUNY Cortland. posted by Howard B. Owens in accident, news, Bethany. Earlier this today a fully loaded semi-truck left the roadway on Route 63 in Bethany and landed in a ditch. Parises has been on scene and is now ready to try and right the truck and get it out of the ditch so Ellicott Street Road is being closed temporarily between Transit Road and East Road. posted by Billie Owens in youth marksmanship, news, steve hawley. Assemblyman Steve Hawley (R,C,I-Batavia) is urging constituents, local officials, Second Amendment advocates, Rod & Gun Club members and anyone involved with youth marksmanship programs to call or write their local representative and Gov. Cuomo requesting a veto of legislation that could virtually wipe out all shooting competitions for youth and training for young people under 16 years of age. The so called “Safe Storage” bill, which Hawley voted against, places unnecessary and ambiguous restrictions on the storage and incapacitation of firearms for those who do not own them and could put an end to youth marksmanship in New York. “As we’ve seen time and time again with these measures that infringe on our right to bear arms, they are poorly written and passed hastily, causing many undue consequences that hurt law-abiding gun owners, hunters and those who simply enjoy marksmanship activities,” Hawley said. posted by Billie Owens in news, batavia, pembroke, Le Roy, prescription drug take back day. 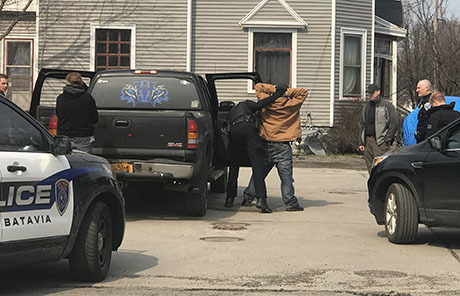 On Saturday, April 27, from 10 a.m. to 2 p.m., Genesee County law enforcement agencies and the Drug Enforcement Administration will give the public an opportunity to prevent pill abuse and theft by ridding their homes of potentially dangerous expired, unused and unwanted prescription drugs. Only pills and other solids, like patches, can be brought to the collection sites—liquids and needles or other sharps will not be accepted. The service is free and anonymous; no questions asked. 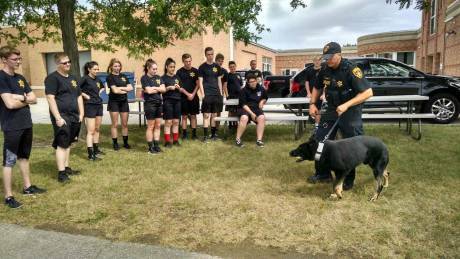 posted by Billie Owens in gc sheriff's office, Teen Academy, news, Byron-Bergen Central School. 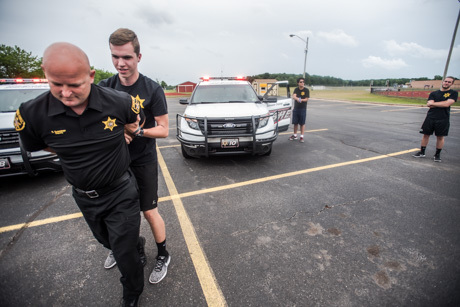 The Genesee County Sheriff’s Office will be offering its second annual Teen Academy July 22 – July 26 at Byron-Bergen Central School. 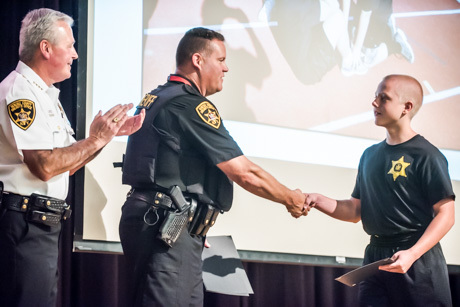 “The Teen Academy is a one-week structured program which consists of instructional classes designed to provide high-school-aged students within our community an introduction to law enforcement training and gain an understanding of law enforcement’s role in their community," said Genesee County Sheriff Bill Sheron. "It is our hope that teens will build confidence while learning good decision-making and leadership skills." Must have their parent’s or guardian's permission. 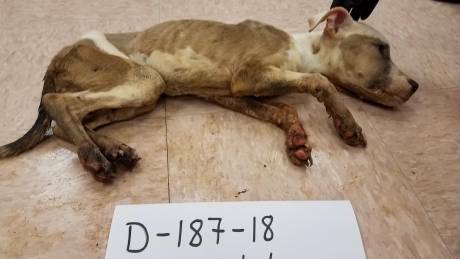 “This is a unique and forward-thinking opportunity offered by Genesee County Sheriff Sheron and Department," said Legislator Shelley Stein, chair of the Public Service Committee. 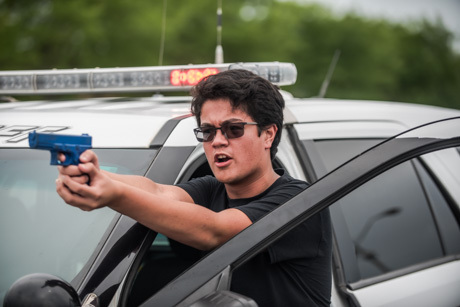 "Teens are invited to immerse and be exposed to the real law enforcement experience. 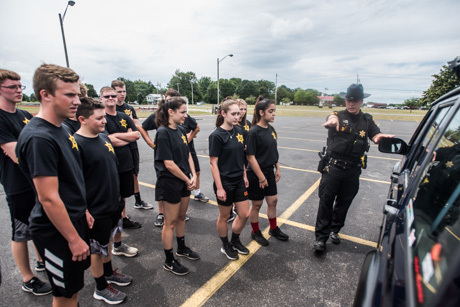 "More than imagining, the academy opportunity is live, in-the-minute learning about today’s community policing needs of an exciting career in law enforcement. Students are encouraged to ‘try on’ a law enforcement career role." There is no charge to attend the academy. Application deadline is May 10. To learn more and/or download an application, visit here. posted by Billie Owens in BCSD, batavia, Musicians Of Note Award, news. Four alumni, one retired teacher, and one posthumous Batavia teacher will receive the Batavia City School District's first Musicians Of Note Award on Tuesday, May 14, at Batavia High School. The alumni to be honored are: Robert Sullivan, Class of 1950, George Whittier, Class of 1951, Derek Reiss, Class of 1971, and Joey Pero, Class of 1999. Former Batavia teachers honored are: Frank E. Owen, BCSD first director of Music for 37 years; and Kenneth Hay, BHS Band director and BCSD Music Department chairperson for 21 years. Ken Hay will defer his award until the Spring of 2020 and we will celebrate his success at that time. They will be honored on the Wall of Fame for making an impact in their field. From 5 to 5:30 p.m., there will be appetizers for guests and recipients in the cafeteria, with dinner to follow. The awards ceremony/concert will begin at 7 p.m. in the auditorium. Dinner and awards concert will be $25 per person. You may attend just the 7 p.m. concert/awards ceremony for only $10, either in advance or at the door. To reserve tickets for the event, please call Batavia High School (585-343-2480, ext. 2000) and ask for Lisa Brown. She will either reserve or mail them once they have been paid. Please pay either cash or check, made payable to Batavia Music Boosters. Ticket reservations must be made by May 1st. The awards ceremony/performance will feature Joey Pero and Derek Reiss performing with the BHS Jazz Ensemble and BHS Brass Ensemble. Robert Sullivan will conduct a musical number performed by Mighty St. Joe’s Alumni Corp. Donations for the Batavia High School Musicians Of Note can be made through the Batavia City School Foundation Inc.
Assemblyman Steve Hawley (R,C,I-Batavia) has strongly condemned the Assembly Majority’s proposal (A.4319) to automatically consider parole of prisoners once they turn 55 years old, regardless of their crimes or imposed sentence. “Making time in prison easier has become the platform of New York’s big-city progressive politicians,” Hawley said. “First it was free computer tablets and pay raises for inmates, then it was pardons and voting rights for violent felons as they go on parole and now shorter sentences no matter how horrific the crime – abhorrent. Hawley has opposed many of the soft on crime measures enacted in Albany this legislative session. Chief among these is the closure of three state prisons, terminating hundreds of jobs and jeopardizing the safety of constituents. “This is an outrageous proposal that jeopardizes the public at large and insults crime victims across the state. I will do everything in my power to not allow New York to become a hotbed for progressive social experiments and I am committed to continuing my fight against these dangerous proposals,” Hawley concluded. posted by Howard B. Owens in Ellicott Trail, news, batavia. 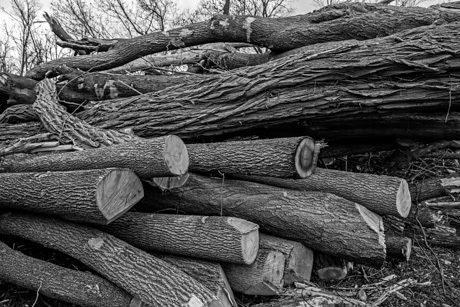 Driving down Walnut Street in Batavia you may notice several trees have been removed and the logs are piled up on the east side of the Tonawanda Creek. 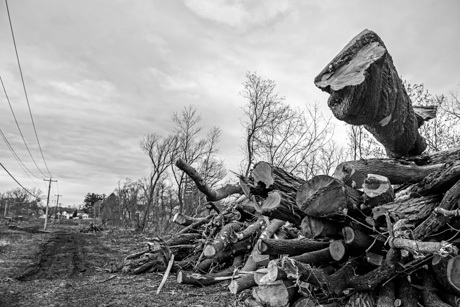 The tree removal is part of the Ellicott Trail project. The trail will cross the creek in this area and in July, according to Matt Worth, Batavia's director of Public Works, a bridge will be placed across the creek at this location. The 4.6 mile, $1.7 million trail -- a cooperative effort between the City, the Town, the County, and the State, should open sometime in the fall. The trail is designed for recreational use by pedestrians and bicyclists. posted by Howard B. Owens in outdoors, news. 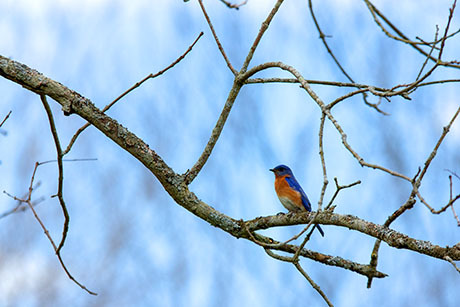 Local photographer Dylan Brew shared this photo with us of an Eastern bluebird.